Scattering of elements throughout memory reduces CPU caching efficiency, which in general favor regular access loops to contiguous memory areas. Branch prediction tries to minimize the effect of running conditional code (such as an if-else statement or the invocation of a base virtual function) by speculatively executing a given branch based on past history. This mechanism is rendered mostly useless when derived1, derived2 and derived3 elements are interspersed along the sequence without a definite pattern. 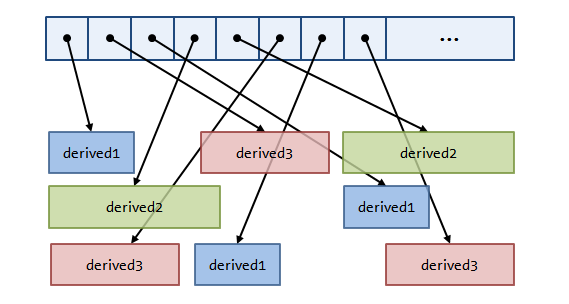 Traversing such a structure reduces to looping over all the segments one after another: this is extremely efficient both in terms of caching and branch prediction. In the process we have however lost the free-order capability of a std::vector<base*> (free order can only be retained at the segment level), but if this is not relevant to the user application the potential performance gains of switching to this structure are large. std::function abstracts callable entities with the same given signature under a common interface. Internally, pointer indirections and virtual-like function calls are used. Memory fragmentation is expected to be lower than with OOP, though, as implementations usually feature the so-called small buffer optimization to avoid heap allocation in some situations. The case of std::function can be seen as a particular example of a more general form of polymorphism called duck typing, where unrelated types are treated uniformly if they conform to the same given interface (a specified set of member functions and/or operations). Duck typing provides the power of OOP while allowing for greater flexibility as polymorphic types need not derive from a preexisting base class or in general be designed with any particular interface in mind --in fact, the same object can be duck-typed to different interfaces. Among other libraries, Boost.TypeErasure provides duck typing for C++. Under the hood, duck typing requires pointer indirection and virtual call implementation techniques analogous to those of OOP, and so there are the same opportunities for efficient container data structures as we have described. The interfaces of these containers are mostly the same and follow the usual conventions of standard library containers.